Offshore trips are average between 6 and 10 hours due to the longer running time to the fishing grounds from the harbor. Depending on the seasonal location of the fish, the areas of the North Drop and South Drop provide exceptional opportunities to catch the fish of a lifetime. These trips typically target Yellowfin Tuna, Blackfin Tuna, Mahi-Mahi, Blue Marlin, White Marlin, Big Sharks, Wahoo and Sailfish. Capt. 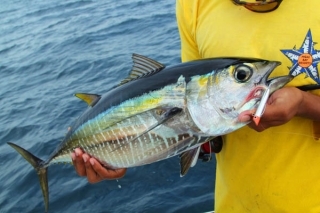 Alvin utilizes live bait techniques for the majority of offshore trips, however trolling multiple artificial lures and rigged ballyhoo is also an effective strategy he uses to entice large pelagic species to bite. The North Drop – An underwater trench north of St. Thomas that circulates with cool water from the Atlantic Ocean and reaches down about 5 ½ miles, to depths of 29,000 feet. The swift moving currents from the ocean depths drive upwellings from the ocean floor delivering nutrient rich plankton and small baitfish to the surface. 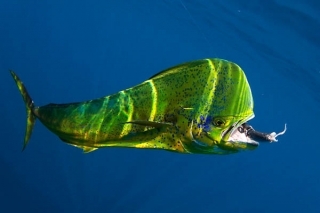 The masses of baitfish and nutrients attract a variety of large offshore species, particularly huge Blue Marlin for which the North Drop is famous for. Hook-ups with other pelagic species such as Dolpin, Tuna and Wahoo are almost a guarantee at the North Drop as well. The South Drop – An underwater trench just a few miles (10-15 minute ride from our marina) South of St. Thomas that is filled with warm Caribbean water, reaching depths of 12,000 feet or about 2 ¼ miles. Similar to the North Drop, underwater currents deliver baitfish and nutrients to the surface along the trench line. Wahoo, Yellowfin Tuna, Dolpin, Blue Marlin, Blackfin Tuna and Sailfish all congregate in this area making it a proven offshore fishing ground.